Today I bought the flowers and plants needed to spruce up my back patio. Normally I’m a sucker for a soft purple and white colour scheme, but this year I switched it up and went with a bright white and yellow palette. This design is what I would love my finished back patio to look like. Favourites in this design would have to be the gorgeous Carlin Fruitwood Pendant, the fun yellow dining chair and the bold collection of patterned fabrics. 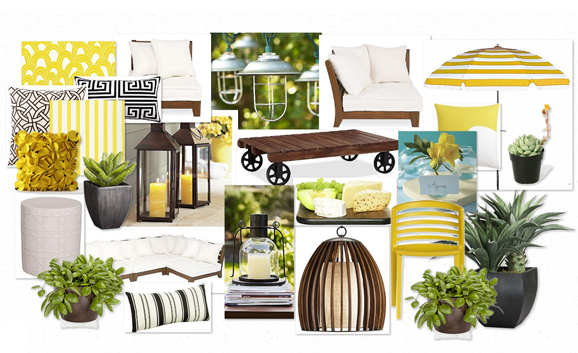 Love to hear how you plan on setting the stage for the outdoor summer season!